The Pseudo-babblers, perhaps more accurately called the Australo-Papuan babblers, are a small Australasian family comprised of five species in just one genus (Pomatostomus). These are social birds whose behavior recalls some typical babblers (e.g., the Turdoides babblers of the Middle East, Asia, and Africa). One pseudo-babbler, Gray-crowned Babbler (left; in a fine shot by W. Ed Harper) is found in both Australia and in s. New Guinea. 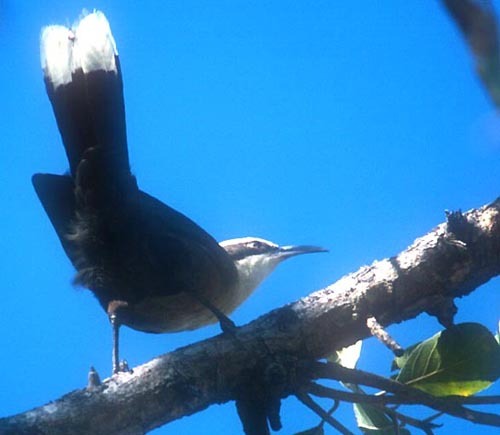 Three other species are endemic to Australia (White-browed P. superciliosus, Chestnut-crowned P. ruficeps, and Hall's P. halli) and the remaining species is endemic to New Guinea and a few offshore islands (New Guinea Babbler P. isidorei). The latter is a forest bird, while all the Australian endemics and Gray-crowned Babbler are birds of arid, semi-open country. In traditional taxonomies, this group was considered just another set in the Old World spread of typical babblers (family Timalidae). In those days, such as when I first visited Australia and acquired a checklist (e.g., Cumberland Bird Observers Club 1979) and other books (e.g., Frith 1976, Simpson & Day 1984), these birds were listed in the Timalidae along with Logrunner, Chowchilla, whipbirds, wedgebills, and quail-thrushes. Today, none of these birds are considered Timalid babblers; indeed, they are split into three different families — this one [Pomatostomidae] plus the Logrunners [Orthonychidae] and the Whipbirds & Quail-thrushes [Cinclosomatidae] — far removed from the typical babblers of Asia and Africa. Their similar size, shape, and behavior to babblers is an example of convergent evolution. This new approach to these groups is one of the major findings of the Sibley-Ahlquist DNA-DNA hybridization work in the 1980s (e.g., Sibley & Ahlquist 1990). They showed that there was a great Australasian radiation, during which many types of birds evolved in isolation for eons. The major families in that radiation were divided between the menurids (including the lyrebirds, scrub-birds, honeyeaters and relatives) and the corvoids (crows, birds-of-paradise, butcherbirds and numerous relations). The Pseudo-babblers (and the logrunners and quail-thrushes) are all in the corvoid group (e.g., Sibley 1996). For reasons that may be explained when the books are published, the Handbook of the Birds of the World series (whose phylogeny I have followed on this web site) proposes to list the pseudo-babblers next to the typical babblers in their sequence. Perhaps this is simply to retain elements of a traditional arrangement? In any event, this small family are comprised of species that are mainly sedentary and highly social. They occur in noisy groups of three to two dozen birds — families or groups of families — and group activities include much vocalization, dust-bathing, feeding and preening. They typically fly low from cover to cover or run swiftly along the ground. These behaviors are very reminiscent of some Turdoides babblers and, like them, this constant movement makes photography difficult. I've yet to photograph any of them, although I seen four or the five species. Pseudo-babblers are also communal nesters. They build huge domed stick nests, one of which is used for breeding and the others for roosting. Several nests may be constructed in the same dead or partially living tree, and they are a conspicuous feature of the Australian 'outback.' Although they eat most insects, they are omnivorous and will take anything from small reptiles to seeds and fruits. Groups may share large food items (biological summary from Blakers et al., 1984, Sibley 1996, Simpson & Day 1996). Photos: The Gray-crowned Babbler Pomatostomus temporalis was photographed by Ed Harper on 19 April 2000 near Cumberland Dam, Queensland, Australia. Photo © 2003 W. Ed Harper and used with permission; all rights reserved. There is no family book as yet, and the Handbook of the Birds of the World has not yet reached this group, but the Australian literature that includes this family is reasonably extensive. Cumberland Bird Observers Club. 1979. A list of the birds of Australia. Based on C.S.I.R.O. research technical paper No. 20. Simpson, K, and N. Day. 1984. A Field Guide to the Birds of Australia, 1st ed. Tanager Books, Dover, N.H., USA.